The Tim Dillard era in with the Brewers may be over, but will not soon be forgotten. Published Dec. 19, 2018 at 2:01 p.m. I first met sidewinding pitcher Tim Dillard in 2014, in the bowels of a Double A stadium in Alabama after a game between the Huntsville Stars and the Montgomery Biscuits. Dillard didn't just rattle off a five-minute litany of baseball cliches during what was supposed to be a short conversation. Rather, our interview went on for an hour, as we discussed his road to redemption from a spot on the Brewers' big league roster to the Mexican league and then, back to Milwaukee's farm league in Double A. 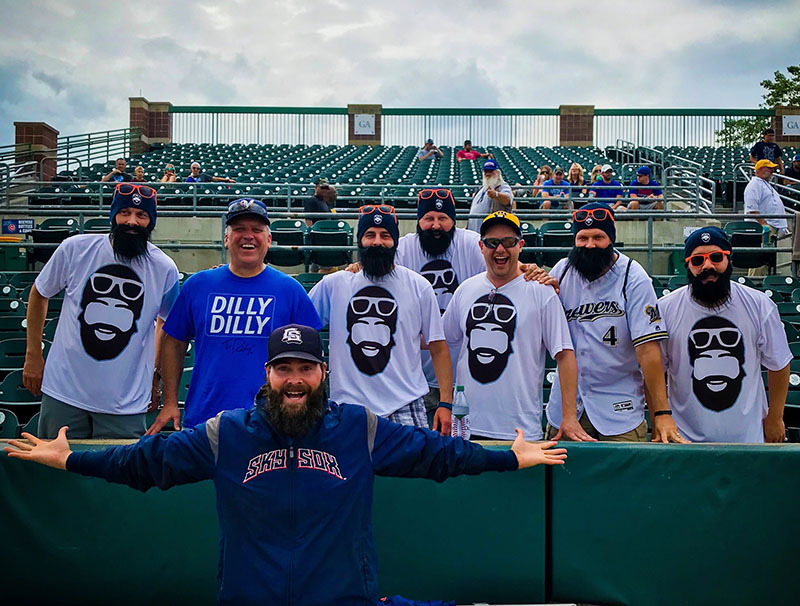 This was before Dillard became a cult hero with Brewers fans, a hilarious social media presence and an OnMilwaukee freelancer during the 2018 postseason – complete with his own emoji. This was before "the beard" and the microbrew and the Brewers post-game analyst gig. This was when he was just trying to prolong an unlikely career that began when the Crew drafted him out of high school as a catcher in 2001. This week, the Texas Rangers signed Dillard to a minor league contract, officially ending his long tenure with the only U.S. franchise he's ever played for. If he reports to Triple A Nashville (which was formerly a Brewers affiliate), as expected, he will finally be able to play in his adopted hometown again, where he's spent many years. 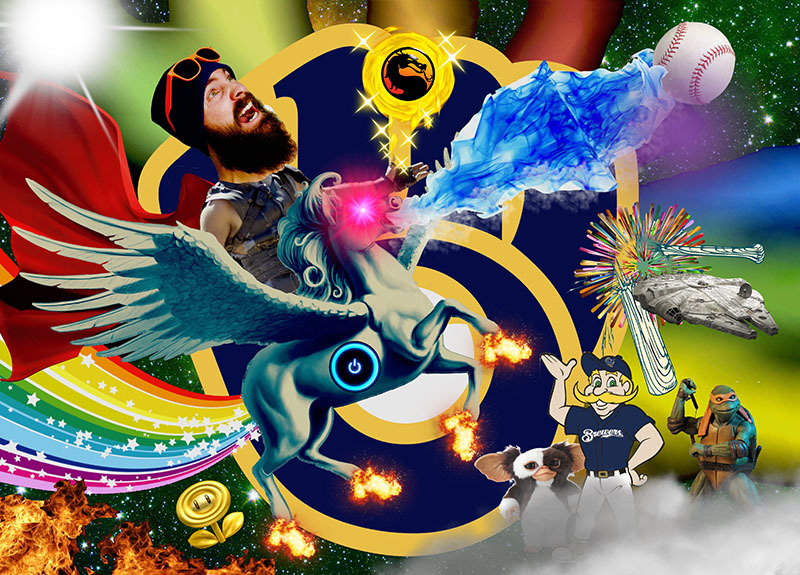 Like me – and most Brewers fans – Dillard finds it all a little bittersweet, but he's excited for the new opportunity to pitch again at age 35. I've been texting with Dillard since this past summer as we worked together on OnMilwaukee projects, but for this interview, we both put on our professional hats – his now says Texas Rangers – and did this last phone interview without our normal laughs and fist bump emojis. 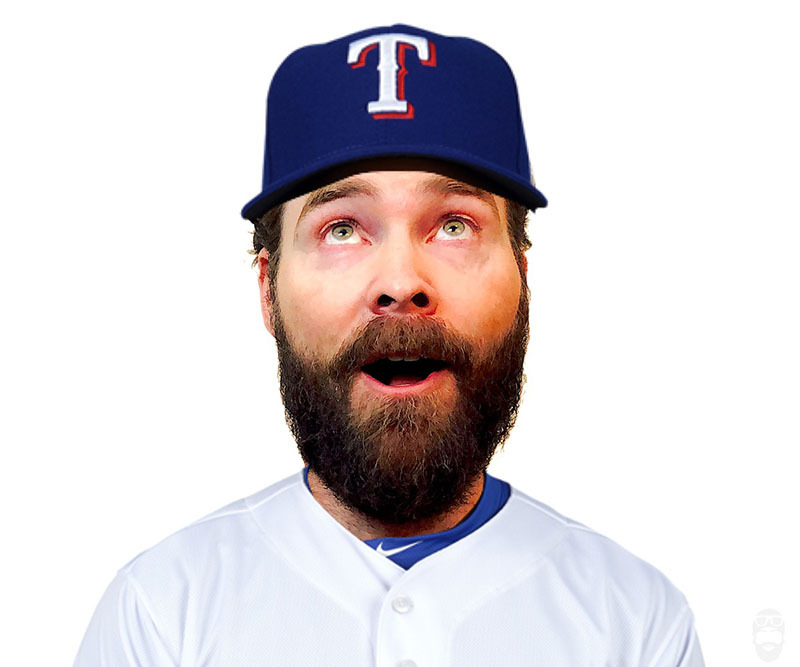 OnMilwaukee: All these years in one organization and now you're a Ranger? Are you surprised? I am. Tim Dillard: I know. I left the Brewers a few times when they didn't want me. I ended up in Mexico in independent ball a few times and in Venezuela, but I always came back. The Brewers always had a need, and they always thought of me. There's a saying in baseball that I've heard my entire life, just because of my dad playing and coaching: There is no loyalty in baseball. But that hasn't been my experience at all. The Brewers have been amazing to me. They are still being amazing to me, as a fan base. I get text messages and Twitter messages and Instagram messages, Facebook. Everyone's been just really forthcoming about their feelings, about what I've meant to them and the organization. It's meant a lot. You have a special relationship with the fans that not every player experiences, right? Sure, sure. I think I have a perspective on the game that, I'm not going to say is right or wrong, it's just my perspective on it. I didn't always have it. I think in 2012, after the season was over and you get that idea that there's no teams, at least in the U.S., that wanted me to play for them. You kind of have that humbling moment where you are like, "What's this all about? What am I doing?" I remember somebody asked me about success. If I measure success in numbers, then I don't have that, right? I don't have the big league years or the big league stats. But now I have a 16-year career. You're going to tell me that's not a success in some way? Years ago, for me, success became about relationships. It's very special to me. When I walk into the clubhouse, it's all about the people that are around me. Whatever that entails. I've kind of harnessed that over the years in a way where I can observe and watch people and then, maybe they need that encouraging word or they need, "Hey, I noticed this play, if you had to back up this base." That kind of camaraderie shifts your focus away from yourself and shifts outward. I think that some people who maybe haven't seen a Triple A game maybe don't realize that the caliber of talent is extremely high at that level. I've seen the Nashville Sounds play before and they could probably beat some Major League teams, don't you think? Yeah, probably not a very high percentage, but yeah. You can take any Triple A team and play pretty much any big league team and there's a good chance. It's just kind of the way baseball is. You can only have so many teams and roster spots. Every one of these guys, at some point in their career, could play in the big leagues. Some guys maybe missed their chance, but they are still hanging on. Some guys are prospects waiting for their turn. The caliber of play is very good. I did the math: There are 750 guys in Major League Baseball. There's like 750 guys in Triple A. Do you ever stop and think about that at age 35, you're still one of the best 1,500 baseball players in the world? I never really thought about it until I got added to the roster for the Brewers' big league roster in 2007. My agent texted me and said – or maybe he called my parents, I don't know if I had the cell phone at that time. Anyway, I talked to him and he said, "Hey, congratulations. You're one of whatever it is, the top 1,200." I don't know if I felt good about that or felt pressure about that. With Texas, do you have the opportunity to play with the big league team or is it understood that this is going to be a Triple A gig for this year? How does that work? It's baseball. Anything can happen. But I will say that chances are very high that I just go to Nashville here in Triple A, which is fine. I don't think they're bringing me in, thinking this guy is going to fill our 8th inning hole. However, anything can happen. I can go to spring training and get a couple of opportunities. It just takes one or two people going, "Hey, let's give this guy a chance." That's really what I'm counting on. I want to come in and surprise. A lot of people maybe followed me on the Instagram, the Twitters and social media. They know me from whatever, but somewhere along the line, I can pitch, too. I know what to do. Once you release the ball, you don't have much control over it, right? There's very little control in baseball of what you can do. You can hone those skills and be ready for your chance. You may go out there and do everything right and not work out. But, you may go out there and do half of the stuff right and it goes 100 percent your way. Just being out there on a big league mound in front of the big league coaches is really the biggest opportunity. You have no idea what can happen at that moment. You have some great games in Surprise, Ariz. this spring, and next thing you know, you could be back there in the big leagues. Question is, being a sidearm pitcher, does that prolong your career or does it make it shorter? I don't know if that's an easier arm angle or a harder arm angle? I've never missed one game in professional baseball due to injury. You're like the Cal Ripkin of the minors. I don't know if anyone else can say that or not. The Lord's given me one ability, and that's to literally go out there and throw a baseball every day. I don't really have any other skill set. For some reason I can do that. I just need to find a team that needs a guy like that. You know, the Triple A pitching coach in Nashville for the Rangers is Brian Shouse. Oh yeah, you played with Shousie on the Brewers. He was a left-handed side arm guy, and he turned 40 that year. I've got an ally in the Rangers department, and it can prolong a career. Age is just a number. Especially for sidearmers because if you are used in a very specific role to get righties out, in my case. If I can get every single righty out then it's going to be hard for me not to be in the big leagues, right? If they are using me correctly, then I can do that for them. That's something that they hold very valuable. Do you feel good physically? Do you feel like you're ready to crank it up when pitchers and catchers report? Oh yeah. I've been working out hard. I'm getting buff. I've never had a six pack but hey, I don't throw with my stomach. Got like a three pack, maybe? Yeah. I got a keg – and this keg has nothing to do with my arm. I work out a lot. I work out with my kids, right? It's not just sitting around in a gym doing one movement where I do bicep curls. I wrestle with my kids and play soccer with them and all sorts of stuff. I'm at the gym pretty much every day. I do a boot camp class. I'm probably faster than I've ever been. I'm probably in better shape than I've ever been. It's just something about cutting out the stuff in your life that's not going to help you and try to harness the stuff that's very specific to the craft you are trying to do. Over the years, things I've learned from strength coaches and stuff like that and other players I've talked to, I know what I can do and I know my limitations. I feel super healthy and ready to go. 35 is definitely not old, but in baseball terms, it kind of is. Do you feel physically different than you did when you were, say, 25? Can you throw the ball as hard as you did then? Do you have as much stamina? I feel different. It's a little different. When I was 25 and first got my taste of the big leagues, I was more over the top. My fastest pitch was 97. It almost got hit through a wall. That's neither here nor there. It's not all about velocity. It's about other things, too. It's about command. I've done relieving, I've done starting from over the top. Then when I dropped it down to side arm in 2010, I didn't know, but by the end of that year in Triple A, I was starting games. It's just a very weird dynamic. Obviously in the last however many years, I've just been used as a bullpen guy. As many innings and things like that. I've figured out a lot of the ways to strengthen my body being able to throw sidearm. My last pitch in the big leagues was in July 2012. My hardest fastball was 85. Now, every fastball has probably been at least 86 and I sit around 88 to 90, topping out at 92. I have changed some things in my workout regime that I know I needed to do to help maintain that velocity. Some people preach consistency, which is fine with me because I've been about as consistent as a person can be in the last six or seven years. I'm just going to continue doing what I can do. Do you feel like you have a familiarity with the Sounds, even though it's not a Brewers' affiliate anymore? Yeah, I know the mascot. We know each other. I know guys in the front office. I know a lot of the fans. I was number 17 when I was there and for most of the time I played parts of eight seasons with the Nashville Sounds when the Brewers were there. That was kind of the reason we live here now because my first year in Triple A was here in 2007. We decided to stay and not go back to Mississippi where my wife and I are both from. This became home because of the Nashville Sounds, basically. They've always taken care of me. When we broke away to go to Colorado Springs, I still kept in touch with a lot of the people there. It was fun. As soon as I took the contract and the Rangers said that, "Hey, we've got your contract. We're good to go," I immediately texted some of the people that I know with the Sounds and said, "Hey, I want number 17 because when I'm done, I want the sucker retired on the wall." So they let you have it? Yeah, I think so. Hopefully, I've already got a locker there and I've got number 17 waiting for me. Did you hear anything from your Brewers teammates or the front office? Is your phone blowing up with people saying they are going to miss you and stuff, or is that not how it works in baseball? For me, that's been the case. It's actually a little overwhelming. I don't really know how to express how grateful I am. There's people that are in the organization, everything from the media department to human relations to community relations, the front office. Players, obviously. Coaches. It's pretty special. Even people that have gone on to other organizations that I knew inside the Brewers have reached out to me. It's constant. Every time my phone buzzes, it's someone else going, "Man, I can't believe you left the Brewers but congratulations. Sorry to see you go but hopefully this will work out for you." A lot of people are like, "Hey, we know you're going to be back with the Brewers someday." Obviously, you want to go win a World Series and be a Rangers pitcher now, but are you always going to be a Brewer in one way, shape or form? A lot of people don't even know this, but I was drafted by the Brewers in 2001 when I was in high school. As a catcher for the Brewers. So that's how far back the relationship goes, man. Even the smallest taste of professional baseball was introduced to me by the Milwaukee Brewers. The people that I know there are lifelong friends, right. People, coaches that I've had, clubhouse guys that I've had that I still keep up with. The friendships are not going to change at all. The jersey will change but the friendships don't change. So Milwaukee hasn't seen the last of Tim Dillard? I don't know. I used to try to look into the future and guess into the future and guess what happen and try to manipulate things to make things happen. Then I realized that that does nothing except waste your energy. I've learned to channel what could be and what's out there, I've channeled that into the energy of who am I with right now. Who am I talking to? Who am I locker mates with? Who am I sitting in the bullpen with? What really matters? To me, that's the relationships of the people who are around me. Do you have anything to say to the Brewers fans who've watched you all these years? Thank you for treating a minor league guy like me like royalty. It's very rare. It's very rare for a player to play this long with one organization. I think it has a lot to do with how I've always been received by fans. I gained encouragement from them. One of the reasons I even got social media, so I could reach out to Brewer fans and get to know them. People that I should know because I've lived this life and these are the people I've come across. The fans. It's the ticker takers. It's the parking lot attendants. That's how I go through life is meeting people that I can influence that have influenced me. I feel that with the Milwaukee Brewers fan base. Probably a lot of it has to do with the Facebook Lives we did during the postseason for OnMilwaukee. Absolutely. If anyone didn't watch our Facebook Lives, they're dead to me (laughs).